My stable is modest, but imho, I get some good tonez from these 2 amps, I run wet/dry rig. ‘90 Mesa Boogie Studio 22+ I use her for my dry amp, set to a pushed clean. ‘15 Marshall DSL40C (Eminence Swamp Thang for a speaker, and MULLARD RI el34s. She’s a beast! Been thinning the herd on my amps. In the last 3 years I’ve bought and sold the same ‘65 Pro Rev twice. Also picked up a ‘66 all tube Vox Cambridge Rev which I ended up selling to a friend after 6 months. Dunno what’s next, probably the Twin but not sure. Does your dog bite ? I THOUGHT YOU SAID YOUR DOG DIDN'T BITE ! He's not my dog. 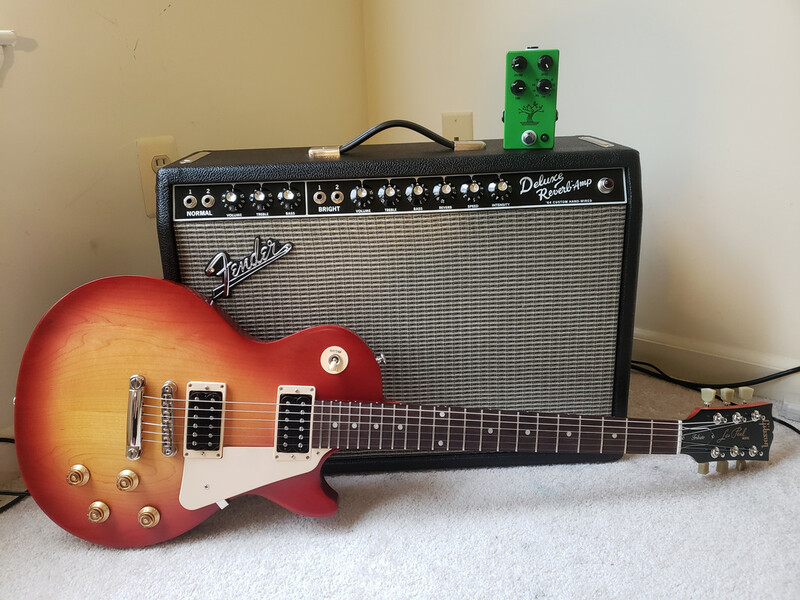 Others are small "practice" amps I've somehow accumulated. Sounds like one I sold many years go. Sure it's an old blue? Pretty sure, the inside of the amp had/has a lot of spiderwebs etc., looks like it was untouched in quite awhile. could be wrong.... I bought it in Orlando Fl. recently the valence is missing from the front and the Vox logo is attached to the grill cloth. I sold 2 tube models and one SS. All looked pretty good cosmetically and I cut them for 12's and used Celestion Blue. I still have one. Fun little amps! Congratulations on the cool find Don. Last edited by MK.II; 07-23-18 at 08:50 PM. In the bathroom, fixing my guitar. People with lots of words are usually lying or stupid. These days? ANY port in a storm, brother! Would love one of those! I've been on an Orange kick lately ever since my latest score. It's a 90's OTR 2x12 combo, a heavy beast of an amp! To my surprise it was built with 70's Transformers/Choke & 70's PC board, really dig the sound of it and even more so when I popped a 12AU7 in V1 to cut back the hair. Those AD's and reissues from the revival period are killer. Some old solid state crate mainly used as a keyboard amp. Not much compared to others here, but I have fun. Been a long time since I listed my amps anywhere...other than with my insurance company, lol. Let's see. Nice! .. and yep, she IS a killer! Bought her new, in August of 2001, and she's been my meat-n-tatoes ever since. You really can't go wrong with 5 knobs, 5 tubes and a 10" Jensen alnico! .. Only changes I made, were a full set of NOS Mullards and I took the back panel off; To let the sound "breathe" better. There is some serious firepower in this thread. My collection is small, but it covers the basics. I want to add a Marshall 18 watt 1973X to the mix. I think they sound great for the music I’m playing now and the size of venue I’ll be in will be small clubs. An overhauled JCM800 4104 combo called "Jimpy jr"
Now resides in a white mojo headshell and coupled with a custommade early 80's Marshall 1936 2x12 replica in matching white. Speakers are celestion creambacks g12m 65 16ohm. Mojotone 5E3 head kit w/ homemade 2x12"
64' Custom Hand-Wired Deluxe Reverb. This thing is ridiculous. 1999 Marshall Bluesbreaker with all modifications... WOW! Nothing vintage in here sadly but I find it a nice little versatile collection. Not photographed: Mesa Boogie 20/20 & Studio Preamp in a rack. My go to amp is my 2015 Marshall 2555X amp into my Marshall 2551 AV cab loaded with my favorite speakers Celestion Vintage 30's . From the Fender collection that now does not get used is a 1962 Fender Brownface Super , 1971 Fender Silverface Twin , 1998 Fender ProSonic ,2011 Fender SuperSonic . Now the Fenders just sit there , and I regret not getting another 2555X half stack -which would look really nice next to the one at home so I can run them together and double the volume and the fun ! and I regret not getting another 2555X half stack -which would look really nice next to the one at home so I can run them together and double the volume and the fun ! From the bottom of the crater. The old story was Duane Alman used to record with a Princeton (IIRC) cranked lying flat on its back. It might make the single speaker react like it's in a closed back cab. Have you ever tried this? I also heard for the Layla sessions they used champs--- have you heard that?